Alex's Nursery The best selection in the area with unbeatable service! Welcome to Alex’s Nursery, Inc.
Alex’s Nursery is owned and operated by Wallace Alexander. We have been proudly serving landscapers, garden centers and wholesalers in the Greater Columbia, S.C. area since 1974. The nursery was originally founded by the Alexander family in the early 1970’s on less than 2 acres in Gaston, SC and has since grown to become one of the largest nurseries in the Midlands serving customers throughout the state of South Carolina. To be able to truly appreciate our inventory we invite you to come out to Alex’s Nursery for a tour of our 20-acre facility. 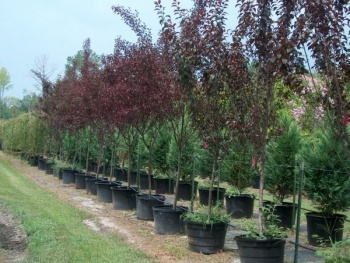 We have over 400,000 trees and shrubs in over 500 sizes and varieties available and are confident that we have everything you will need for a residential or commercial application. We take a great deal of pride in providing our customers with the highest quality stock available. Alex’s is continuously adding new items to keep our customers aware of the latest trees, shrubs and perennials available for the landscape industry. We offer one of the Midlands largest varieties of trees and shrubs in the most popular sizes.